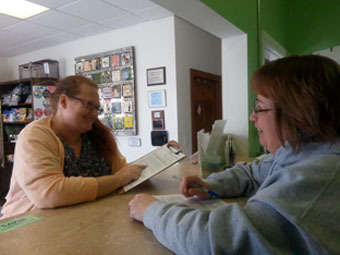 Drop-off time at the clinic is 7:30 AM for CATS and RABBITS and 8:00 AM for DOGS. Pick-up time for DOGS is 4:00 PM and 4:30 PM for RABBITS the day of surgery. Pick-up for CATS is 7:00 AM the morning following surgery, with the exception of Friday. On Friday, CATS will be released at 4:30 PM the same day. We are, at times, able to alter this schedule to a limited degree, but prior arrangements must be made. Please discuss this with us at the time of scheduling. If prior arrangements are not made and you are late to pick up your animal, there is a $10 an hour kennel fee. Food for Cats and Dogs: Do not give your cat or dog any food after midnight the night before surgery; but do allow access to water. Make sure that your cat or dog is kept confined (or inside) to ensure that it does not eat anything! If there is a possibility that your animal has eaten, please let us know when you check your animal in. Food for Rabbits: You MUST provide pellets and hay for them to eat before and after surgery. Rabbits cannot be fasted! If you pet is showing any signs of illness the day before surgery, please call us to discuss. All cats and rabbits must come in an individual carrier, with newspaper or a towel. Cardboard carriers may be purchased for $5 at the clinic. Feral cats must be brought in a humane trap that is covered with a sheet or towel. Traps are available for rent from IHA. There is a $50 returnable deposit fee per trap. More information is available on our Community Cat page. All dogs must be on a leash or in a carrier. Cats and rabbits in carriers or traps may be brought into the clinic when you arrive. To reduce your dogs stress level, it is important that you leave your dog in the car while you check in. We will call dogs to enter individually when check-in is complete and the veterinarian is ready to for pre-surgical exams. Fill out one medical admission form for each pet. It is very important that you present any vouchers, certificates, or coupons when you check in. We accept cash, checks, and credit or debit cards. A $2.00 processing fee will be applied for any card payments. Payment is due upon pick-up of your pet(s).